I love the smell of bread cooking in the oven and then when it comes out. To me it just makes the house smell warm and inviting. I haven’t made bread in a long time, and really had a craving for it. 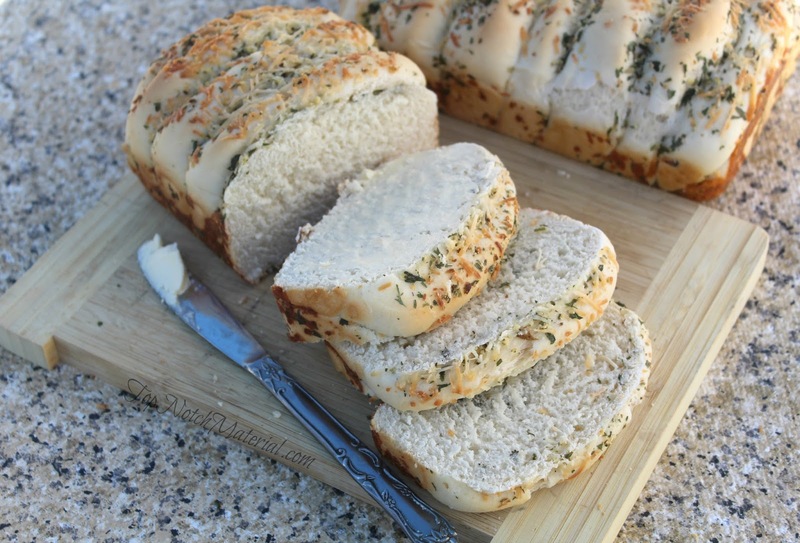 Since, we love garlic in my house, so I wanted to make bread that incorporated it in. So, I made some pull apart garlic bread. It’s easier to use a stand mixer with a dough hook, so my instructions are using that. If you don’t have one, just adjust accordingly. Add warm water to the bowl of the mixer. Then add sugar and yeast. Allow to sit for about 5-10 minutes or until foamy. Add the softened butter, milk, salt and 3 cups flour. Mix together, adding the remaining flour 1/2 cup at a time. If 5 cups total aren’t enough, then add ½-1 more cup, just until dough is smooth. Let it knead for 7-10 minutes. While the dough is kneeding… get two shallow bowls. In one, combine butter, parsley, oregano and minced garlic. In the second, put the grated Romano cheese. Once the dough is ready, form into one big loaf and cut in half. Then form each piece into a 4 x 18 inch rectangle (or close to). Cut each loaf into 9 slices. Tip: don’t let the pieces touch after cut as they will stick together again. Dip each piece of dough into butter mixture, then dredge lightly in cheese and line them up in loaf pans. There will be some remaining cheese, so sprinkle the rest over the two loaves. Cover pans with kitchen towel and let rise until doubled, about 1 hour. When done, the bread should just fall out of the pan when tipped upside down. Let it cool for a few mins and serve while nice and warm! This looks so good! 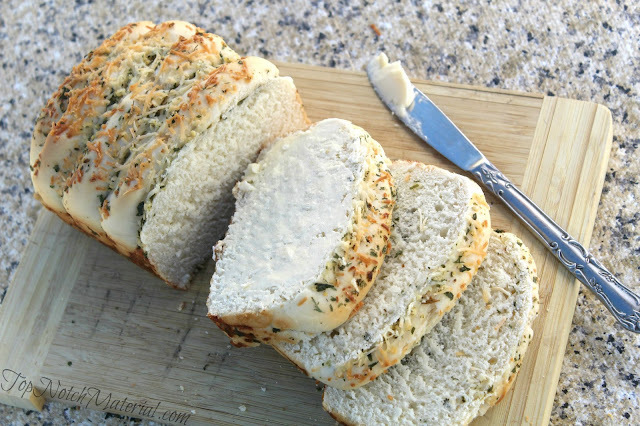 Love garlic bread - I could make a meal out of it! you can definitely do that. it's not really just in the topping as you coat each piece in it, but yes i think adding to the dough would work as well. This looks so good and would be great with spaghetti. I could also see us dipping it in a garlic sauce...love garlic! Making homemade bread this always a family treat. This a great recipe to make soon!!! I love garlic bread and this recipe sounds delicious. Never made my own bread, but there is a 1st time for everything. This looks delish! This would be good with spaghetti. This sounds amazing, I love garlic bread! I am not a fan of the way it tastes when I make it with French bread, butter and garlic so I usually buy frozen. I know, terrible. I definitely want to try this recipe next time though, thanks for sharing!